Beijing: The Chinese central bank has ordered city commercial banks to stop lending to non-financial firms for conducting arbitrage business between the primary and secondary bond markets, banking sources said on Thursday. The People’s Bank of China, at a meeting with 31 city commercial banks on Wednesday, also ordered these banks to stop bond intermediary and deposit businesses that do not involve money, the sources said. The meeting was organized by the National Association of Financial Market Institutional Investors (NAFMII), an industry organization entrusted by the PBOC to help supervise the country’s bond market. NAFMII in a report on Thursday confirmed the convention of the meeting but did not give details of the businesses now under tighter central bank supervision. 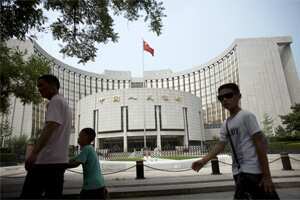 The sources said the PBOC and the National Audit Office had also launched an investigation into existing transactions.